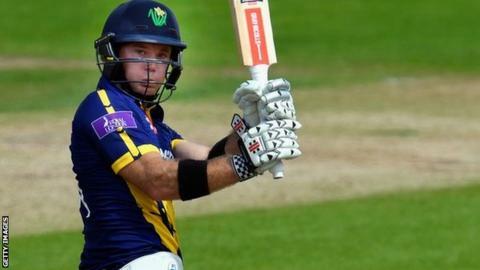 Glamorgan batsman Colin Ingram says first-team exposure at Lord's in a One Day Cup defeat by Middlesex will have provided "invaluable experience" for their younger players. Glamorgan rested pacemen Michael Hogan and Graham Wagg after their qualification chances disappeared. Ingram said it was "nice to see" spinners Andrew Salter and Kieran Bull do well in the eight-wicket loss. "It'll be a good experience if a harsh one," said century-maker Ingram. Glamorgan round off their 50-over campaign against Lancashire at Old Trafford on Wednesday, 19 August. Their hopes of a third victory were destroyed by Middlesex opener Dawid Malan who smashed a career-best 156 not out to take his side home with 10 overs to spare. But Ingram relished his own achievement of reaching three figures at Lord's, making 102 off 93 balls in the visitors' total of 251-9 to record his third century in five games. "It's always nice to come to Lord's, it's a good day out and I just kept working hard. "When you're playing well it's key to realise that and try to extend it as long as possible. "I was fortunate again to do that today and thoroughly enjoyed it. "We're a competitive team, but it's a good opportunity for some of these young guys to come in and put up their hand and really learn a lot.. hopefully they'll be big players for us in the future." Among the younger players on show was 20-year-old off-spinner Kieran Bull, making his limited-overs debut and claiming a respectable 1-40 in eight overs. "It was a great experience especially here at Lord's, you don't get many better places to play than this. I really enjoyed it though it's a shame about the result," said Bull. "I've done well in the second team, played one championship game last week at Swansea [against Gloucestershire], so hopefully I can push on into the final one-dayer and the four-day stuff and do well." Bull is going into his final year at Cardiff Met University, having passed this year's exams. "Playing university cricket while having exams has been difficult at the start of the year. "But once university finished at the beginning of June I've really enjoyed being around full-time."